1. I thought I'd alert you to the fact that Elspeth Young's 2011 calender "Women in the New Testament "is now discounted online for only $4.00! Granted we are already two months into the new year but if you haven't got a calender for the year this would be a good idea! Even if you already do have a calender you could get it just for the pictures. My brother-in-law got me one a few months ago and it is really beautiful. If you haven't discovered Elspeth's work you need to. The only thing to be aware of is that the pictures are only half pages... I was sort of disappointed by that... but they are still big enough that you could cut them out and frame them in smaller frames. And for $4 that is a good deal. 2. So I guess I stretched the truth a bit when I said that I don't ever make New Year's resolutions, because this year I did make one. Not to get any more fines at the library. Lets just say that last year we "invested" quite a bit of money into our local library system. This year I'd like to actually have it be a FREE service. So far I'm doing good. We are two months and 7 or 8 library visits into the year and still NO FINES. Lets hope I can keep this up. 3. Next week my hubby and I are going down to BYU's Museum of Art to see the Carl Bloch exhibit. In addition to the original copy of "Christ Healing the Sick at Bethesda" that BYU owns they currently have four of Bloch's original altar paintings that have been gathered from churches in Denmark and Sweden. This is the first time these painting have been removed from their original spots since the late 1800's. I am really excited to go see them! We are also going to drive down to Manti, Utah to go to the temple. Minerva Teichert, another fabulous LDS woman artist, painted the murals in the Manti temple. I've always wanted to go see them. This seemed like as good a time as ever. Is that a bad reason for going to the temple... wanting to see the art work? "I believe mother is one of those very carefully chosen words, one of those rich words—with meaning after meaning after meaning. We must not, at all costs, let that word divide us. I believe with all my heart that it is first and foremost a statement about our nature, not a head count of our children." Take a minute to go over and read the rest. I am really impressed with this blog as well. I'm excited to see what else these ladies have to say. 5. After my post about how I study my scriptures one of my readers, Mariesa, led me to The Red Headed Hostess and her post about how she does her scripture journals. It is very inspiring. Even though I don't think there is any way in 1,000 years my handwriting will ever look like hers. She also has tons of wonderful ideas on how to improve your scripture study. This lady is a PRO at scripture study. Oh goodness. Totally understand about the library fines. My hunny and I used to go to our local library to check out videos, but we'd keep forgetting to return them, so we once owed 5 dollars! We still laugh about it till this day that we go to the good ol' free library to "rent" movies instead of "checking it out". Thank you so much for pointing me in the direction of The Red Headed Hostess. I loved the section you did on studying scriptures and Elder Bednar's talk has been a favourite with me as well. I've also loved peeking into people's study journals for ideas. I likewise Wish my hand writing was like hers! On library fines--whenever I get upset by our library fines, David points out to me that there isn't another public institution I'd rather support financially. It softens the sting. On paintings in temples--David's mother was the assistant matron in the Oakland Temple and used to be asked to give talks about going to the temple in surrounding wards and stakes. She talked about the pictures she had up in her house of all the family members and then talked about how in the temple the pictures up are of the One whose house it is. She would bring copies of two or three of her favorite paintings in the Oakland Temple and talk about those stories from Christ's life. It was one of the most inspiring temple talks I've ever heard and has made me look at the paintings in temples differently. So, yes! 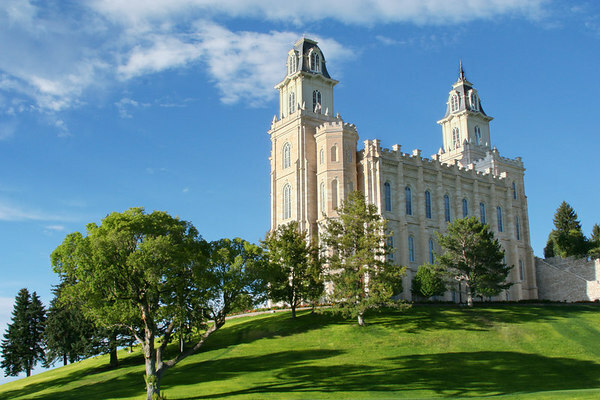 that's a great reason to go to the Manti Temple! Yeah, I think I could almost buy the library for all the fees I have paid. I really hate that. It does help if I just remember that it is all for a good cause. I love the paintings in the Temple. They are beautiful, and each one is different. I love Elder Bednars talk too. Heather! Thanks for the lovely reference. And that quote really is a winner, isn't it? I've come back to it a number of times. Um and yea... I try to stay on top of the due dates but I confess, those fines can get on top of me instead. There could be worse things right? And agreed on the paintings.... though I didn't know that Teichert did Manti! I've never been. But the Sacramento Temple (my hometown) has some really gorgeous, inspiring murals that are incentive enough for me to attend, not to mention the blessings and everything else.